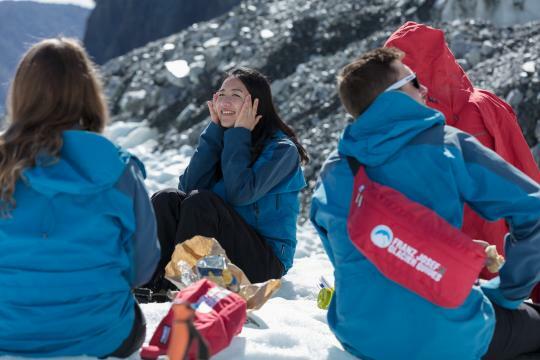 Franz Josef Glacier Guides is located in the Glacier Base Building, 63 Cron Street, Franz Josef. Our purpose built guiding facility is the perfect place to start your day. Come in and grab a coffee or snack at the cafe before your trip and meet the friendly team. Can I wear my own boots? You are welcome to wear your own good quality ankle-supporting hiking boots with our crampons, or you can choose to wear the boots that we provide. 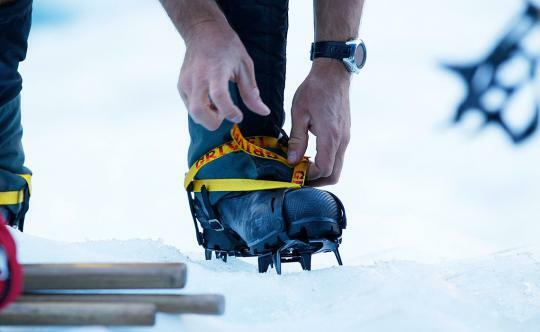 Our boots are comfortable and warm and wearing them means that you won't damage your own boots when strapping on the crampons. If you choose to wear your own boots, bring them in for a fitting the evening prior to your tour departure to check they are suitable. What is the check-in time for my trip? Check-in time for all our trips is 15 minutes prior to the trip time stated on your booking confirmation. You will need to check in with our team in person at the glacier base building in Cron Street. This allows enough time to prepare you for your trip, fill in medical information, give a weather update, and get you kitted up with all the necessary equipment. 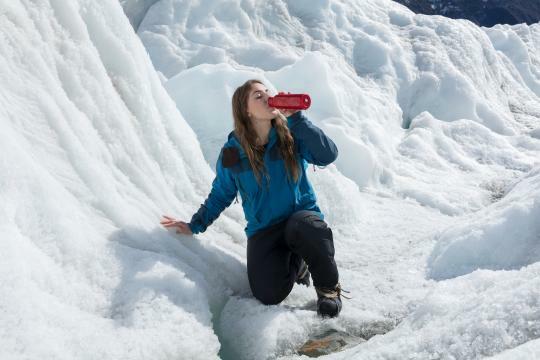 As we are out in the valley or on the ice for more than three hours at a time, you will need to bring a light snack and small bottle of water to keep you refreshed. You also have the option of purchasing one of our snack packs when making your online booking. Do I need to bring a backpack? 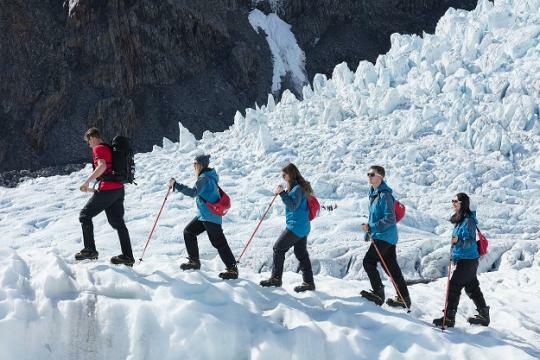 If you have a small backpack you are welcome to bring this on your Glacier Valley Walk, however, we ask that you do not bring a backpack on your Heli Hike or Ice Climb as there is limited space in the helicopter. On all our trips we provide you with a small waist bag to carry your essentials (phone/camera, sunscreen, sunglasses, water and a snack). Please do not bring passports, wallets, selfie sticks or keys. 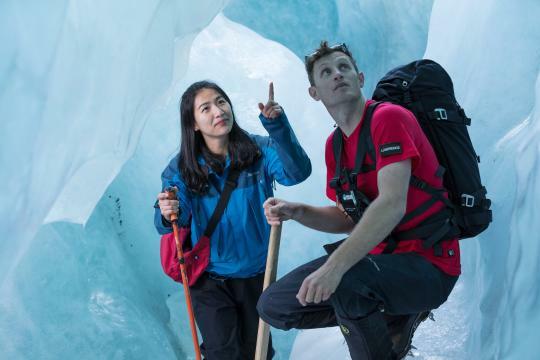 Given the changeable nature of the glacier, we can't guarantee which features will be visible on any given trip. However, because we land high up on the ice you're able to explore a good portion of the glacier where blue ice very often features. 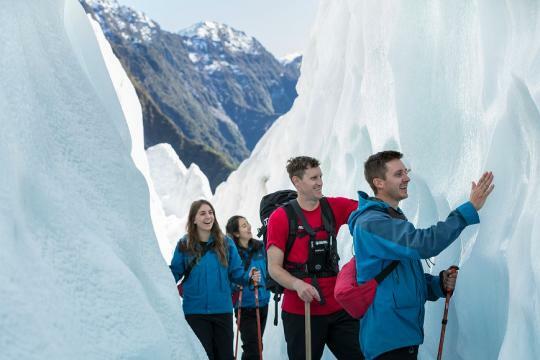 Our ice support team will be looking for the most interesting features as they prepare the hike route for the day, and your guide will also keep a keen eye out for the most spectacular hike route available for your trip. The temperature on the ice is typically around four to six degrees cooler than in town. 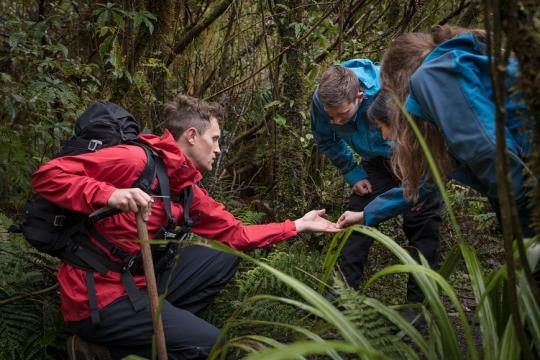 The alpine environment can be very changeable so we recommend being prepared for a range of conditions by wearing a warm base layer (ideally merino wool or polypropylene) and a warm mid layer (merino wool or fleece) which will then be covered by the waterproof jacket we supply. If you feel the cold it's a good idea to wear an additional base or mid layer as it's better to be too hot and have to remove a layer while on the trip, rather than be cold for the duration of your experience. We ask guests not to wear jeans on the ice as these absorb water quickly, making you colder faster. Do I get my money back if it is raining? It is the high annual rainfall in the glacier region (6-8 metres per year) that allows the glaciers to grow and without the rain, these magnificent glaciers would not be here. However, heavy rainfall, high wind and low cloud can also prevent helicopter operations as we adhere to strict safety standards in this area. Why can't I wear jeans? Jeans get very cold and uncomfortable when wet, so we recommend you wear lightweight trousers or shorts. We provide waterproof over-pants to wear on top of your shorts or trousers to keep you warm and comfortable. How long is the helicopter flight? The heli transfer from the valley to the landing pad on the glacier is around 4.5 minutes long each way. You'll get great views of the valley and the surrounding mountains on the way, but the primary function of the flight is to provide access to the glacier. 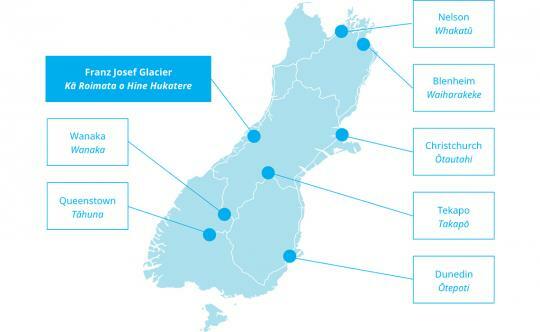 If you're keen for a longer scenic flight with no hiking on the glacier involved, we can give you some recommendations of local operators who provide this service. 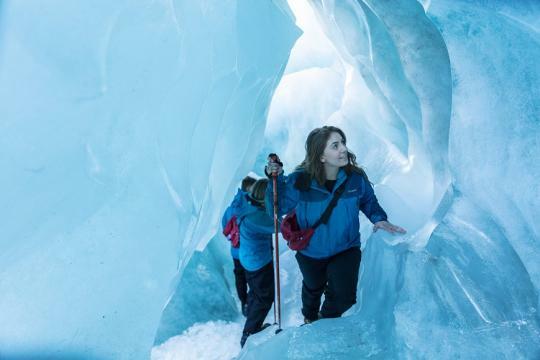 Due to the nature of the glacier and the valley floor in which our tours operate we do have some restrictions on the participation of children. These restrictions are in place to ensure the on-going safety of all our guests and team members. There are minimum age, weight and height requirements for children wishing to join our Heli Hike trips, see our terms and conditions page for this information. Due to glacier and weather conditions these guidelines may change and participation in the hike is ultimately the decision of the lead guide on the day. All children under the age of 18 years old must be accompanied by a paying parent or guardian for the duration of the trip from check in until return to base after the hike. 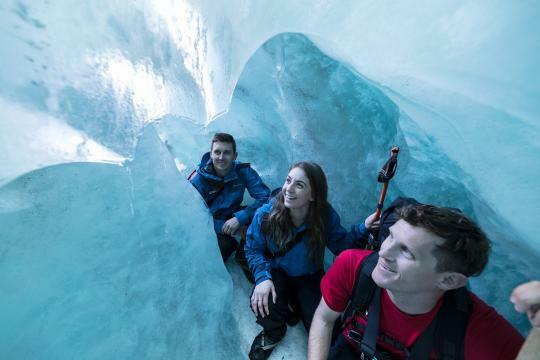 The minimum age for the Heli Ice Climb experience is 16 years and a full paying parent or guardian must also accompany anyone under 18 years for the duration of this activity. For our Glacier Valley Walk the minimum age for a child is 6 years, and while weight and height are not as critical for this activity, there may be some occasions where conditions in the valley are not suitable for younger children therefore participation will again be the decision of the lead guide on the day. If you have any concerns or queries about a child's participation on one of our tours please get in touch with our team on 0800 484337 and our team will be happy to help.